SAVE $20 ON THE HIT THRILLER MINDGAME! "SHEER CRAZINESS in the tradition of SLEUTH and DEATHTRAP!" 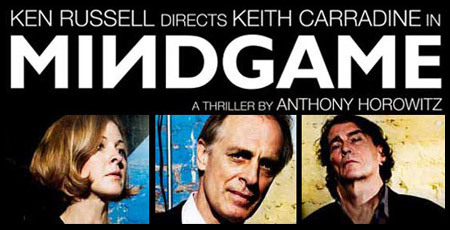 Tony Award nominated actor Keith Carradine (The Will Rogers Follies, Dirty Rotten Scoundrels, Nashville, Dexter) returns to the New York stage in the premiere of Anthony Horowitz's acclaimed thriller, MINDGAME. Ken Russell, the celebrated director of the films Tommy, Women In Love and The Boy Friend, makes his New York stage directorial debut. Also starring Kathleen McNenny & Lee Godart. When a writer of pulp crime novels gets an interview with a notorious serial killer he believes he has snared the coup of his career. But when he arrives at the asylum, he finds nothing can be trusted, not even his own eyes. Through a series of lies, manipulations and memories, dark secrets are revealed. Now Playing Tuesday - Sunday at 8PM. Saturday & Sunday at 3PM. Restrictions: Maximum 9 tickets per order. There will be a $4.50 service charge added to each ticket purchased. Subject to availability. Blackout dates may apply.